I'm following up on my previous post about my online identity by tracking my experience with Windows Live. As background, everytime I have booted my computer for the last few years, the Windows Messenger software has asked to get updated. Until this past week, I've always said no. And in my office computer, everytime I start a Microsoft Windows application, it asks me to participate in Windows Live. In neither case did I have any idea what would happen if I said yes. 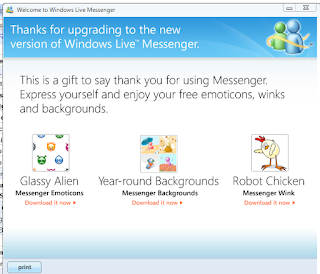 This past week, I accepted the Messenger update which was a long update. Near the end, I unchecked a bunch of boxes so that my search engine (Google) would stay the same, my home page would stay the same, and that my computer would not be tracked to help Microsoft for their debugging or marketing. I note that the choices were clear and visible in plain English so no complaints there. There was one pop-up which I dislike both from websites and software installation. This one asked me if I would install some of their software on my computer "as a thank-you." Being very suspicious of such things, I declined.